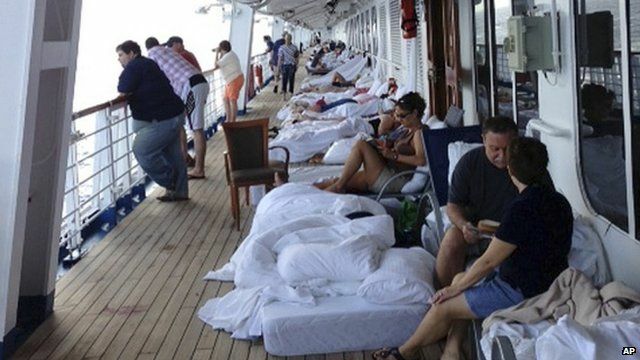 A stranded cruise ship with more than 4,000 people aboard is within sight of the US coast four days after an engine fire knocked out the vessel's power. Towed by tugboats, the Carnival Triumph is due to reach Mobile, Alabama on Thursday night, local time. It could take five hours to unload. Zeshan Sharif, a stranded passenger, told BBC News that conditions on board the stricken liner have been tough. Mr Sharif said passengers have endured overflowing toilets, water shortages and dark corridors.